In this groundbreaking book, Aldon D. Morris's ambition is truly monumental: to help rewrite the history of sociology and to acknowledge the primacy of W.
E. B. Du Bois's work in the founding of the discipline. Calling into question the prevailing narrative of how sociology developed, Morris, a major scholar of social movements, probes the way in which the history of the discipline has traditionally given credit to Robert E.
Park at the University of Chicago, who worked with the conservative black leader Booker T.
Washington to render Du Bois invisible. 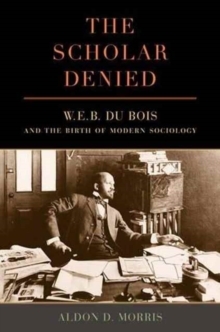 Morris uncovers the seminal theoretical work of Du Bois in developing a "scientific" sociology through a variety of methodologies and examines how the leading scholars of the day disparaged and ignored Du Bois's work. The Scholar Denied is based on extensive, rigorous primary source research; the book is the result of a decade of research, writing, and revision. In exposing the economic and political factors that marginalized the contributions of Du Bois and enabled Park and his colleagues to be recognized as the "fathers" of the discipline, Morris delivers a wholly new narrative of American intellectual and social history that places one of America's key intellectuals, W.
E. B. Du Bois, at its center. The Scholar Denied is a must-read for anyone interested in American history, racial inequality, and the academy. In challenging our understanding of the past, the book promises to engender debate and discussion.